What does Milkshake Duck mean? A Milkshake Duck is a person (or thing) who becomes extremely popular on the internet for some positive reason, but as their popularity takes off and people dig into their past, they quickly become an object of outrage and hatred. Where does Milkshake Duck come from? This Twitter joke soon went viral with tens of thousands of retweets and likes. Milkshake Duck resonated with people so much because the tweet parodied a very real phenomenon that had until then been unnamed. This scenario immediately brings to mind Ken Bone. Bone and his bright red sweater gained unexpected fame after he asked a question to the US presidential candidates during a debate held October 2016. He immediately became an internet celebrity, but as past Reddit comments came to light, Bone’s fans soon turned on him. In a June 8, 2017 episode of the podcast Reply All, host PJ Vogt introduces the term Milkshake Duck to his colleagues to help frame a situation in which a beloved Twitter account about dogs caused a segment of its followers to be upset when it got political. Suddenly former fans were sending hateful messages to the account they had loved with the same intensity only days before. Interest in this term was relatively flat until about a year after Ward’s tweet, and days after the Reply All episode was released. According to Google Trends, on June 11, 2017, Milkshake Duck spiked in lookups. This was due to a much-anticipated videogame called “The Last Night.” As more positive press came out about the game, a Twitter user dug up some old tweets from Tim Soret, one of the lead developers, which outed him as an outspoken Gamergate supporter. Suddenly the positive press for “The Last Night” shifted into a discussion of Soret’s controversial politics. 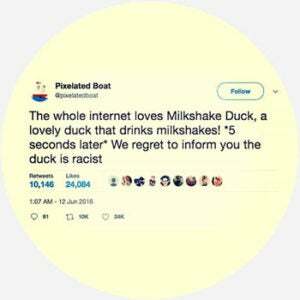 Milkshake Duck is primarily used by those who are social media savvy and spend a lot of time immersed in internet culture. A Milkshake Duck doesn’t have to be a person, though it’s generally used to refer to a person. Sometimes it’s spelled with initial capital letters, but it often appears all lowercase. The term can also be used as a verb. You can be milkshake ducked by someone else or you can milkshake duck yourself.